One thing that I have come to love over the years as most women do is receiving personalized gifts. I personally think receiving a personalized gift shows that the person who is giving the gift was thinking of you personally and wanted to create something extra special just for you. One thing that I am really loving is personalized Christmas ornaments for my families Tree. While growing up my Grandma had a special ornament for each of her children and grandchildren on her tree. That was a special thing for us all to find our ornament on the tree. That is why I think personalized ornaments are a extra special gift to give someone. They are a gift that you can pick out and create especially with a certain person or family in mind. It is also a gift that they will use for years to come to adorn their Christmas Tree. I love the personalized ornament I got this year from Ornaments.com for my upcoming Christmas tree. It was fun to look through all the different ornaments available on the site. The only thing I got discouraged with on the site there site is lack of ornaments for bigger/larger families, because the bigger ornaments can also be used as wonderful gifts for Grandparents as well. 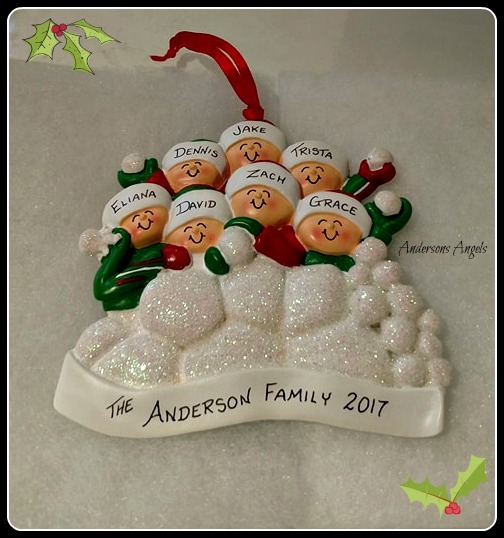 Once I picked out my ornament it was easy to get it personalized correctly because the personalization form is labeled with each person on the ornament. I have had problems in the past with different sites not having the ornament labeled so you had to guess whose name was going to be who once placed on the ornament. You don't have to play the guessing game when ordering from Ornaments.com site. Plus personalization is free on all ornaments and you also can get a free gift box as well with your ornament. Make sure you stop by Ornaments.com and check out all the great ornaments they offer. I am sure you will find a beautiful ornament to adorn your Christmas tree this year or one to give as a gift! Make sure you get your orders in soon to beat the Holiday rush!